Cute as they are, rabbits can do a lot of damage in the garden. Since there is always more than 1 rabbit, trapping is not a practical option. And while there are some plants rabbits do not particularly like, they will eat anything if they get hungry enough. To keep rabbits from destroying your garden, you will need a combination of repellents, diversions, and barriers. It would be nice if we could just figure out what rabbits avoid and place that throughout our yards. But as with all animals, repellents only work part of the time. If an animal is hungry or even too young to know better, they will munch on anything. However rabbits are somewhat picky, especially about scent, and repellents can be quite effective. Any repellent is going to need to be re-applied throughout the growing season. Most will need to be reapplied after a rain and after there has been a good amount of new plant growth. It's always a good idea to alternate repellents so that the rabbits do not get used to any scent or flavor. Rabbits do most of their feeding in the evening and into the night. To be most effective, apply deterrents at the end of the day. Fertilizer Repellents: Blood meal and bone meal are natural soil amendments that make very good rabbit deterrents. Rabbits are herbivores, and the scent of these slaughterhouse by-products is usually enough for them to look elsewhere for food. Both are available as fertilizer, in garden centers. Blood meal is high in nitrogen. Bone meal is also a source of nitrogen and is high in phosphorous. They break down in the soil, and will need re-application every week or two. Home Remedies: There are many household products used as repellents, with mixed success, from human hair to black pepper. Pets: Pets provide some deterrence, but rabbits may prefer to live near domesticated animals, because it means they are relatively safe from the more dangerous wild animals. Still, a dog or cat will help keep the rabbit population in check. If rabbits are content with the food that is easily accessible to them, they won't be so persistent about getting into your flowers and vegetables. 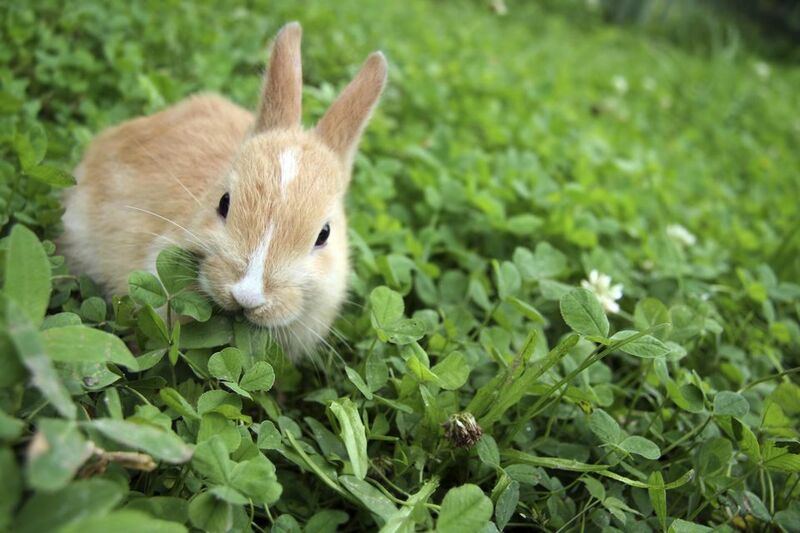 A rabbit favorite you can easily provide is clover. Overseeding your lawn with clover will provide them a ready source of food and it will even feed your lawn, since it is a legume and fixes nitrogen. Clover seed is often available next to the grass seed. Modifying your yard to make it less hospitable for rabbits is not really practical for most of us. It would involve removing or reducing overgrown areas where the rabbits would find cover. That could be around fencing or along hedging or other large structure. Rabbits will also seek cover under staircases and porches. Many favorite rabbit plants can be found in the vegetable garden. They are particularly fond of tender young shoots and dark, leafy greens. If you have a problem with rabbits, you are definitely going to need to fence in your vegetable garden. Rabbits will chew right through plastic and fiberglass fencing. Go with metal. A coated metal is easy to work with and lasts longer than non-galvanized fencing, which will rust. The hole openings should be no more than 1-inch wide. A height of 2 - 3 feet will deter them. Rabbits can squeeze under gates. Put a flashing of fence at the base of the gate. Do not leave the gate open while you are in your garden. They will be happy to hide out until you leave. Rabbits will gnaw on woody plants, like blueberries and hydrangeas, especially in the winter. To protect freestanding plants, encircle them with 2 - 4-foot high fencing. You don't have to bury it, but make sure there is no access at ground level. And keep the fencing several inches from the trunk of the plant. Remember that snow cover will allow the rabbits to reach higher up on the plants. If you routinely get several feet of snow, make your fencing higher. Rabbits have wide-ranging tastes and there are many plants they will nibble on. In my yard, pansies, hydrangeas, blueberry stems, pea plants, bean plants, young pepper plants, beet greens and Swiss chard and the most favored plants, besides clover and violets. Rabbit Scram has an extensive list of plants damaged by rabbits, from the plants, they eat most often to the ones they visit occasionally. This is a tricky one. The University of Illinois Extension has a list of plants least browsed by rabbits and it doesn't include any vegetables. Here are some of the herbs and flowers they list: lobelia, snapdragons, petunias, astilbe, columbine, iris, peony, purple coneflower, basil, chives, oregano, rosemary and sage, buddleia, lantana, lavender, and viburnum. Of course, animals are unpredictable, so you will have to pay close attention to what happens in your yard and take action accordingly.